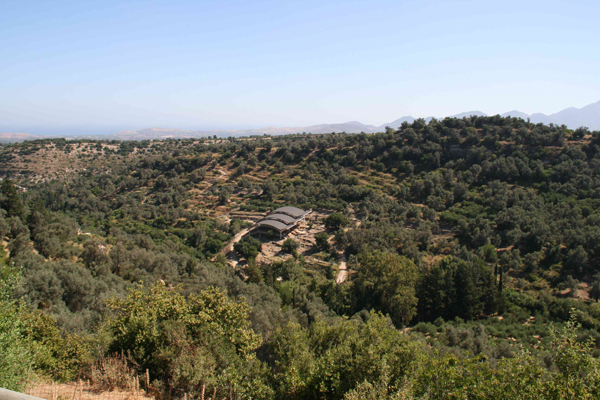 Over the past two and a half decades, archaeologists have excavated the acropolis, city, and necropolis of ancient Eleutherna under the direction of famous archaeologist Nicholas Stampolidis. Occupation dates from the Early Bronze Age (ca. 3000 B.C.) to the Middle Ages (12th-13th century A.D.). Although the cemetery is filled with skeletons, the tranquil site is teeming with life, including an orchestra of chirping cicadas and a troupe of yellow butterflies dancing in the ever-present gentle breeze. Additional information about the site, featuring video interviews with Stampolidis and important team members, will soon be available online. The cemetery at Eleutherna (center) is covered with an elaborate protective roof. It was designed to blend in as harmoniously as possible with the landscape. This entry was posted by Eti Bonn-Muller on Saturday, July 25, 2009. Discussion of this blog entry is now closed.